As more and more people make the shift from books with tangible pages that you can turn and feel, to electronic reading devices, an artist shows us just how beautiful books can be in a very different artistic sense. I give you, carved book landscapes by Guy Laramee. Click the picture below for more amazing book sculptures! Attensity brings to light people’s disdain for FB’s new Timeline format. Another good read from MarketWatch on this topic. What is your take on the Facebook Timeline for personal profile pages? …That I have finally organized and put-together my first networking event of 2012! Taking place on Thursday, February 9 from 6pm-9pm, it is open to job-seekers, job-providers, or anyone that is looking to grow their network with other business professionals in the Bay Area. I am very excited to be hosting this at a really unique little wine bar called The Hidden Vine. 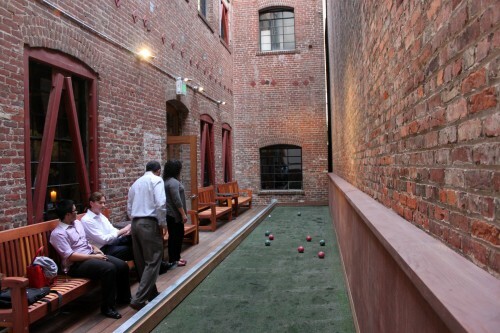 What makes it so cool is the Bocce court right outside in the converted alleyway, which I have reserved for the night of the event from 7pm-8pm for anyone who wishes to play. For more details on the event and to RSVP (which is required to attend) check it out here: http://awnetwork.eventbrite.com. Now I just need to follow these rules and stop checking my e-mail!